On a recent trip to the United States, the Crown Prince of Saudi Arabia, Mohammad bin Salman – known to most as MbS – declared that his efforts to reform the Kingdom of Saudi Arabia would not be curtailed by conservative members of the Wahhabi ulemma – the Kingdom’s religious establishment. Instead, MbS stated a desire to return the Kingdom to “moderate Islam”, curtailing the power of religious institutions in the process. Although Islam is the source of law in the Kingdom, providing the underpinning of the Basic Law which operates in lieu of a constitution, religion occupies a far more fundamental role across the state. The Al Saud has long relied upon Islam to help members of the ruling family secure legitimacy that was not derived from tribal ancestry. The Al Saud derive domestic and international legitimacy from positioning themselves as the leading Muslim state, whilst also serving as the ‘protectors of the two holy places’, Mecca and Medina, fulfilling such responsibilities by protecting those who make hajj, the pilgrimage to Mecca that is mandatory for all Muslims. As a consequence, any effort to challenge Saudi Arabia’s position within dar al Islam is viewed as an existential challenge to the Al Saud. When Iranians took to the streets in 1978, widespread anger culminated in the establishment of an Islamic Republic under the leadership of Grand Ayatollah Ruhollah Khomeini a year later. At this time, many in Saudi Arabia feared the establishment of an explicitly Islamic republic on the eastern shore of the Persian Gulf and quickly sought to frame the revolution as both Shi’a and Persian, reducing the appeal of Khomeini’s revolutionary vision. In the following years, the two states embarked on an fractious rivalry replete with moments of crisis – such as the hajj deaths of 1987 – and burgeoning rapprochement, after a devastating earthquake cost the lives of thousands in Iran. Yet the 9/11 attacks put paid to such diplomatic manoeuvres and with the US State of the Union speech of 2002, Iran was positioned firmly within the ‘Axis of Evil’. In recent years, the rivalry between Saudi Arabia and Iran has become increasingly important in understanding the machinations of Middle Eastern politics, with a growing body of literature from the likes of, Robert Mason, Lawrence Rubin, Banafsheh Keynoush, and Hassan Ahmadian, albeit with limited recognition in scholarly work. The rivalry fuses national interest with religious considerations amidst an increasingly fragmented political landscape, yet is typically framed as a consequence of ‘ancient hatreds’. The collapse of sectarian difference into geopolitical considerations following the US-led invasion of Iraq in 2003 has provided both Riyadh and Tehran myriad opportunities to increase their influence across the region, seemingly at whatever the human cost. Whilst some are quick to identify sectarian difference as the source of the rivalry and others seek to reduce it to pure power politics, the reality is a more nuanced, locating religion within the political fabric of the state. Although the fragmentation of political organisation and descent to violence has typically fallen along sectarian lines and viewed as driven by competing visions from Riyadh and Tehran, history reveals a different story. Prior to the revolution Saudi Arabia and Iran endured a fraught yet peaceful relationship, punctured by a number of issues concerning territory and oil. Reflecting such a position, the Truman Doctrine – which sought to curtail the geopolitical influence of Communism – sought to develop a tripartite alliance comprised of Iraq, Iran and Saudi Arabia. Such efforts were eviscerated by the 1979 revolution and this development dramatically altered the organisation of regional security. Efforts to create order and security have involved the development of myriad strategies. Beyond traditional military approaches of alliance building and posturing, Saudi Arabia has used Islam as a means of solidifying its position in the region, perhaps best seen in the proselytizing of the Wahhabi message in the response to Nasser’s Pan Arab vision. Although difficult to ascertain exact figures, estimates suggest that the Al Saud spent between $75 and $100 billion in their evangelical cause. In contrast, Iran spent a great deal on establishing and supporting Shi’a groups such as Hezbollah, the Lebanese Party of God, and the Islamic Front for the Liberation of Bahrain as a means of challenging the regional order. Such strategies from both sides positioned Islam firmly at the heart of political and security calculations across the Middle East. The importance of Islam in the fabric of both states meant that declarations of leadership and claims to legitimacy were quickly seen in ‘zero-sum’ ways. Islam thus became a site of contestation, seen in the hajj deaths of 1987 which led to Iranian pilgrims boycotting it for a number of years. The events of 1979 dramatically altered the construction of regional security, with states across the region fearing the expansionist ambitions of Khomeini’s vision of veleyat-e faqih – that established political order in the absence of the 12th Imam. Such fears were exacerbated by the establishment of groups such as Hezbollah and the provision of support to the Islamic Front for the Liberation of Bahrain, who attempted to overthrow the Al Khalifa in 1981. Such support means that any form of political dissent amongst Shi’a communities is quickly framed as a consequence of nefarious Iranian activity. Tensions over regional security also emerged amidst competing visions of the role of external actors within the Gulf. For many in Riyadh, the Kingdom remains reliant upon an alliance with the US that dates back to an agreement between Ibn Saud and Franklin Delano Roosevelt reached on the deck of the USS Quincy on January 22nd 1945. In contrast, Iran saw itself as uniquely qualified to regulate the Gulf region, stemming from the history of the Persian Empire. Of course, such a view was not palatable to Riyadh or, indeed, other Sunni Arab states. America’s role in the Gulf was seen to be central in ensuring their survival. This alliance has been largely respected by US and Saudi officials over the following decades, but Barack Obama’s comments in an interview with Jeffrey Goldberg in The Atlantic caused a great deal of consternation, suggesting that “the Saudis and Iranians must find an effective way to share the neighborhood and institute some sort of cold peace”. Obama’s comments prompted widespread condemnation and ire across the Gulf and as a consequence, few in the Gulf were sad to see the end of the Obama administration. The election of Donald Trump was generally well received, coming at a time of existential transformation in the Kingdom. The son of King Salman, MbS had already been one of the more powerful people in the Kingdom prior to becoming Crown Prince, but his new role positioned him as the next ruler of the Saudi state at a time of great regional and global uncertainty. 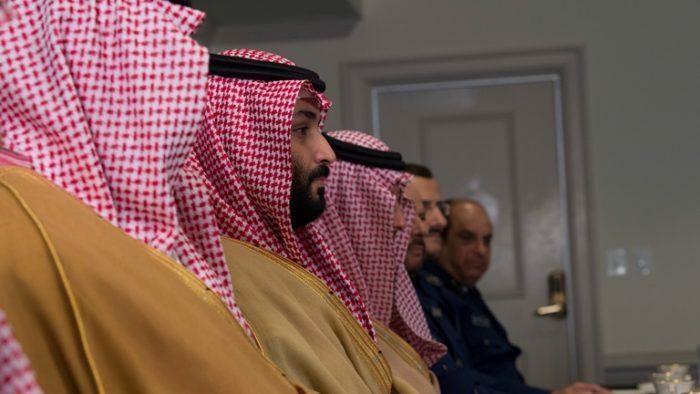 Since being named Crown Prince, MbS has set in motion a transformative programme designed to do three things: 1) to consolidate his power; 2) to position the Saudi state to deal with future economic challenges; and 3) to secure the Kingdom’s position across the Middle East, particularly with regard to the challenge from Iran. As part of this effort, a number of prominent Saudi Princes and business elites were arrested and detained in Riyadh’s Ritz-Carlton hotel – one of the world’s more luxurious prisons – in an attempt to exenterate corruption from the Saudi state; some suggest that this ploy released around $1 billion into the Saudi economy. Economic reform is central to the transformation of the Kingdom. Whilst the creation of Vision 2030, NEOM – a transnational city and economic area designed to facilitate an “entire new land, purpose-built for a new way of living” – and movement away from traditional values were central to the MbS’ long-term vision, this was a source of consternation for many. Reforming the social fabric of the state was deemed necessary for the Saudi Kingdom to embrace modernity and prepare for the ‘post-oil’ climate. Underpinning such calculations is a profound distrust of Iranian activity across the Middle East, which is predominantly viewed as expansionist aspirations. Such fears led MbS to draw parallels with Nazi Germany and to refer to Iranian Supreme Leader Ali Khamenei as “worse than Hitler”. Comments about the Shi’a Crescent and an Iranian ‘land bridge’ only fuel such fears of Iranian activities. This also reveals the difficulty of securing the Kingdom’s position in the Middle East, the third aspect of MbS’ plan, seen in the development of a so-called ‘Triangle of Evil’, comprised of fears about Iranian expansionism, the Muslim Brotherhood and violent Sunni extremism. In For Space, one of the more influential works of Political Geography in recent years, Dawn Massey argues that we should understand space by considering three propositions: First, that space is a product of interactions from the “intimately tiny” to the global; second, that space is a heterogeneous sphere of possibility; and third, that space is always under construction. Employing such a framework helps us to understand the manifestation of the rivalry between Riyadh and Tehran in spaces across the Middle East which has been shaped by on-going interaction of domestic machinations and the policies of regional actors, resulting in the development of particular manifestations of space. Since the revolution of 1979, a number of areas of competition have emerged – both in the region and beyond – which have been shaped by the interaction of local, regional and international pressures. Events in Bahrain, Iraq, Lebanon, Syria and Yemen have often referred to as sites of ‘proxy war’ between Saudi Arabia and Iran, albeit in a manner that belies the complexity – and agency – of actors on the ground. Since MbS was named Crown Prince, Saudi efforts have been driven by an increasingly vociferously anti-Iranian agenda. Central to these concerns is political fragmentation, which creates space for the emergence of such fears. In Iraq, long-standing Iranian support for political figures was a continued source of consternation for Saudi Arabia. Moving away from traditional approaches, the Saudi embassy was opened in Baghdad, whilst there were also efforts to reach out to Muqtada Al Sadr, the nationalist Shi’a cleric who was traditionally been an Iranian ally. Whilst Bahrain was historically viewed as the ‘epicentre’ of the regional and sectarian competition between the two states, in recent years, the Al Khalifa has eradicated any space for dissent and political opposition through the cultivation of a master-narrative that frames such agendas as a consequence of perfidious Iranian manipulation. Space in the Levant has taken on a great strategic importance for both the Gulf powers amidst the (re)construction of domestic and regional security. Both Syria and Lebanon have been affected by the decentralisation and fragmentation of power from the core, creating opportunities for local actors to interact with external allies and shape space in their image. The onset of the Syrian war – we should avoid ‘civil’ given the presence of myriad external actors – provided an opportunity to “win Syria back to the Arab fold” albeit unsuccessfully, leaving Assad and his backers in power. In neighbouring Lebanon, the political landscape continues to be shaped by the interaction of domestic and regional forces, as competition between the Saudis and Iranians interacts with socio-economic conditions across the state – typically along sectarian lines – resulting in the emergence of the March 8 and March 14 blocs. Both Riyadh and Tehran have attempted to exert influence over the Lebanese political arena, exploiting the country’s divisions in an attempt to shape space according to their wishes. The curious case of Saad Hariri, the Lebanese Prime Minister, reveals the extent of Saudi fears and the level of influence the Kingdom exerts over Lebanese politics. In early December 2017, Hariri was summoned to Riyadh where he was forced to resign before being held captive. The decision to remove Hariri stemmed from the perception that he was not doing enough to restrict the power and influence of Hizballah across Lebanon, increasing Iranian influence as a consequence. Yet as a consequence of the creative diplomacy of Emmanuel Macron – who visited Riyadh and stressed the potential repercussions of the move – Hariri was allowed to return to Lebanon where he rescinded his resignation. On the same night that Hariri was summoned to Riyadh, a missile was fired at the King Khalid airport from Yemen, revealing the capacity of Yemeni actors to strike at the heartland of Saudi Arabia. The missile, allegedly made in Iran, was intercepted by anti-missile technology and Saudi Arabia declared the incident as an “act of war” by Iran. Additional missiles were later fired at targets across the Kingdom, including at Mecca. Events in Yemen are incredibly complex amidst a struggle between internationally recognised government and Houthi rebels, underpinned by competing claims to power and authority emerging from a tribal landscape that challenges the sovereignty of the state. Furthermore, the conflict is generally framed as a proxy war between the two major Gulf powers, yet such a framing is infelicitous given the direct Saudi and Emirati military action across the state. Houthis have long been viewed as an Iranian proxy and although they are Shi’a, they subscribe to the Zaiydi strand of Shi’a Islam, not the Twelver strand followed in Iran. Reducing the conflict to a struggle about ancient hatreds is deeply problematic, denying local political agency and removing all scope of possibility from space. Such a view fails to adequately explain the evolving rivalry between Saudi Arabia and Iran which has oscillated between periods of high tension and of burgeoning rapprochement. Moreover, it also fails to take into account domestic change within both states. Under the tutelage of MbS, the Kingdom of Saudi Arabia has embarked on a new path, embracing modernity and seeking to move away from the foundational elements of the state, yet such a move risks provoking serious dissent. The vociferously anti-Iranian agenda has also pushed the Kingdom closer to Israel, in a classic example of real politik, much to the chagrin of many across the state who still hold Palestine as a cause célèbre. On the same state visit to the US, MbS was asked questions about Iran and the Joint Comprehensive Plan of Action. Speaking to CBS, he asserted that Saudi Arabia did not want to develop a nuclear arsenal but if Iran did, the Kingdom would “follow suit as soon as possible”. Following President Trump’s withdrawal from Iran’s nuclear deal (Joint Comprehensive Plan of Action – JCPOA), there is growing concern at what the future holds for the Gulf region and Middle East. Whilst Saudi Arabia is experiencing existential transformations in political and social life, the Middle East faces an increasingly precarious period. Dr Simon Mabon is Senior Lecturer in International Relations at Lancaster University, where he is also Director of the Richardson Institute. Mabon is the author of a range of books and articles relating to Middle Eastern politics and the rivalry between Saudi Arabia and Iran in particular, most notably Saudi Arabia and Iran: Power and Rivalry in the Middle East (London: I.B. Tauris, 2015). He is currently working on a follow up, to be published in 2019, along with directing the Sectarianism, Proxies and ‘De-Sectarianisation’ Project (SEPAD), a Carnegie Corporation funded project that looks at the impact of the rivalry on the contemporary Middle East.